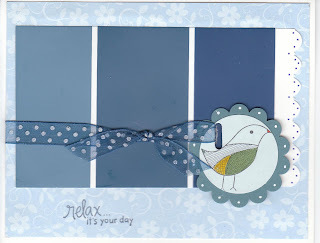 What fun to create this card with your sketch challenge!! In used a paint sample from the hardware store to create the rectangles, added the scallop edge and a marker for the dots on it. The scallop is SU's scallop circle punch. the center is SU's 1-3/8" circle. The bird image is from Hero Arts Decorative Bird set and the sentiment is from AMuse. The dp is an old set from SU. I like all these colors together on this card. Thank you for viewing my card. Linda, what a great idea to use the paint sample! Your card is awesome. Cute - I like the edging! !